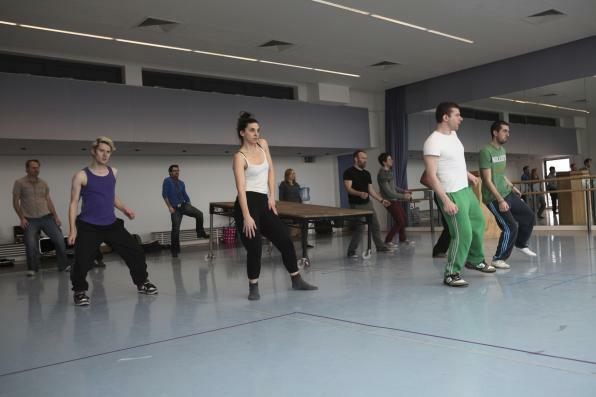 For all the latest behind the scenes info direct from The Rehearsal Room, check out our photos and blog. Also, you can watch an interview with Jo Strictland, who works as a deputy stage manager at the Globe. We asked Jo how she approached her role and what challenges she faced working for the Globe. We are currently waiting for our set to arrive at the Madinat Theatre, which is our next port of call on the tour. The first show is done!!! It was pretty nerve-wracking, as it always is, but it was really great finally having an audience as their reactions are the final missing ingredient. It's very late and we have just finished the tech. I think one of my favourite moments was seeing everyone in their costumes for the first time. It adds so much to the performance, making the world of the play more fully realised as well as helping to differentiate between characters if actors are playing multiple roles, as most of us are. This production is no exception. For our party scene everyone is in fancy dress and it was absolutely brilliant and surreal seeing everyone appear for the first time in their eccentric and brightly coloured outfits. Right, time for bed. In past years we have opened the show at the Globe then taken it on tour. This year is different, we play Romeo and Juliet in 3 other venues in Qatar, Dubai and Abu Dhabi. Before we could perform the show to an audience though we had to 'tech' it in the theatre. The 'tech' is the period of technical rehearsal that leads up to performance and over this period the costumes, music, props, set and lighting are added to the play to make up a full production. There is a slight difference with our show though, and with most productions made for the Globe, as we have live music and no lighting to speak of. At the Globe in London there is no roof to the theatre, which means the plays are performed essentially outdoors, keeping performers and audience in a shared light. To try and transport that experience to Qatar, Dubai and Abu Dhabi we are leaving the lights on in the auditorium so, like at the Globe, performers can see the audience and the audience can see them. What's great about this is it means that we can talk directly to people in the audience, which happens most commonly in soliloquies, but also in asides and moments of public address, among others.